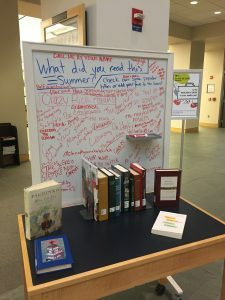 This entry was posted in Midd Blogosphere and tagged library, libspotlight, LIS Staff Interest on September 24, 2018 by Leanne Galletly. 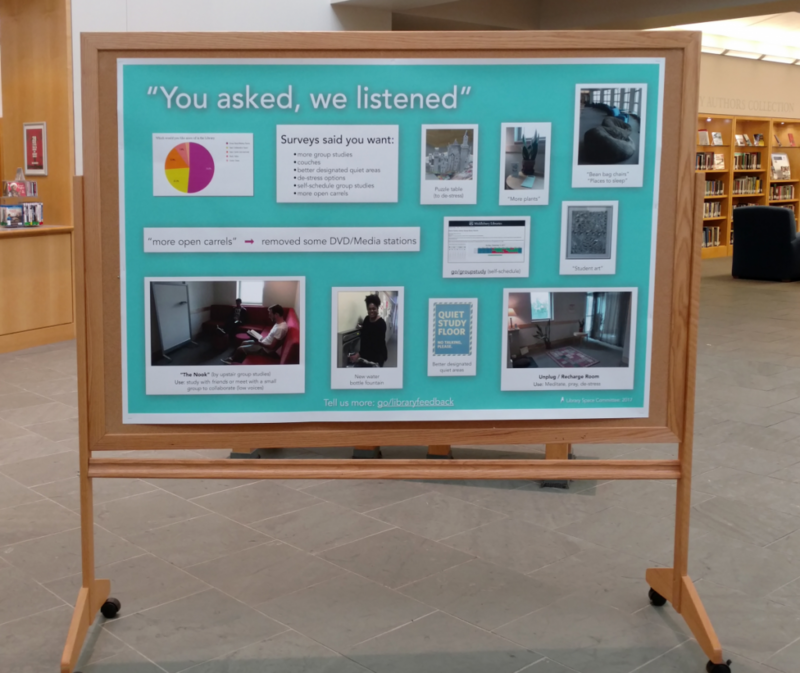 The Library Space Committee has created a billboard display in the atrium to showcase how student input impacts space decisions made here at the library. 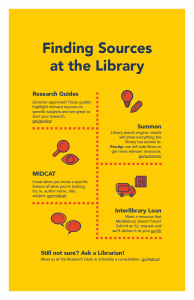 Background: The Library Space Committee collected student feedback about the library, as part of a 2016 lobby survey and a media carrel area survey. With this information the Library Space Committee made or influenced changes to the library, including the creation of “The Nook” and the Unplug & Recharge Room. Also highlighted on the billboard display were other smaller changes that were made or supported by the team including: a new water bottle fountain, more plants, puzzle table, acquiring student art, better designated quiet areas, bean bag chairs, opening more carrels on the main level (by moving or removing equipment), and a self-schedule service for study rooms. Last week the Space Committee concluded a three week seating survey. The results will help the Committee to learn more about students seating habits and what improvements can be made to library spaces. This entry was posted in Midd Blogosphere and tagged Library Spotlight, libspotlight, LIS Staff Interest on December 13, 2017 by Leanne Galletly. This entry was posted in Midd Blogosphere and tagged Library Spotlight, libspotlight, LIS Staff Interest, Post for MiddNotes, spotligh on November 6, 2017 by Leanne Galletly.